A mysterious sinking, a group of dedicated scientists and technicians and a 200 year old shipwreck have all collided in the Gulf of Mexico. Four thousand feet below the choppy seas the remains of a 19th century shipwreck lie in wait and a month long expedition has been mounted to uncover her secrets. This is the deepest underwater archaeological project ever attempted and Nautilus Productions spent 14 months working with archaeologists, conservators and scientists from Texas A&M and the Minerals Management Service (now BOEM) to create a one hour, high definition, educational documentary about the project. The Mardi Gras Shipwreck site is located just off the Louisiana coast in the Gulf of Mexico in nearly 4000 feet of sea water. The team used a state of the art remotely operated vehicle (ROV) to survey the wreck and recover artifacts from the site. Information indicates the shipwreck may date between the 1810 and 1820 time period and could possibly be a War of 1812 gun runner, privateer or British trader. The artifact assemblage includes intact sand clocks, glassware, cutlery and even a period stove. Texas A&M’s Center for Marine Conservation (CMAC) handled the conservation of the artifacts removed from the bottom of the Gulf of Mexico. These cultural treasures are now on public display at the Louisiana State Museum. Tryon Palace in New Bern, North Carolina and the Jean Lafitte National Historical Park and Preserve in Louisiana provided period backdrops for the documentary. Since the 1996 discovery of the wreck by Intersal, Inc. the Nautilus staff has been the official video crew for the study and recovery of the infamous pirate Blackbeard’s ship the Queen Anne’s Revenge (Concorde). Project videographer, Rick Allen, and our staff has worked with the North Carolina Underwater Archaeology Branch documenting this incredible underwater find. 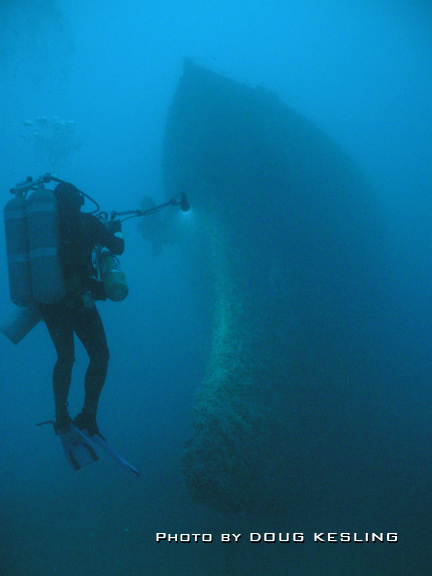 Nautilus Productions’ duties have included the video documentation of site activities above and below the water as well as the archaeological survey, provenience and recovery of artifacts from the shipwreck. We own and maintain the video library containing nearly two decades and over 80 hours of stock footage from the wreck site and project. This archive is the digital video record of the project. Our Queen Anne’s Revenge (QAR) footage has been seen in over a dozen documentaries and broadcast worldwide on ABC, BBC, CBS, CNN, History Channel, Discovery, National Geographic, NBC, PBS, Smithsonian Channel, Travel Channel, ZDF and more. 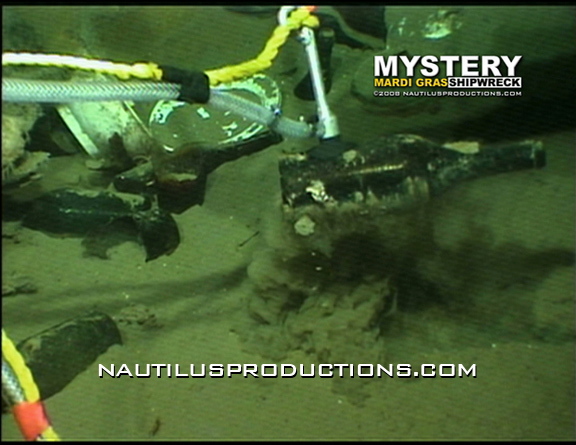 In the fall of 2000 Rick Allen’s Nautilus Productions co-produced with Bill Lovin of Marine Grafics a groundbreaking, week long live internet webcast known as QAR DiveLive from the Blackbeard wreck site. For the first time ever, live video and audio was broadcast from an underwater archaeological site to the World Wide Web. Students were able to watch the underwater archaeology in real time and ask questions of the scientists exploring the shipwreck. The twice-daily live distance learning programs reached an estimated 1600 students from as far away as Canada during the five days of broadcasting. In October of 2001 Allen and Lovin again co-produced DiveLive 2001. This time the interactive webcasts from the seafloor and conservation laboratories of the Queen Anne’s Revenge Shipwreck Project reached over 3600 students and another 2700 remote viewers from fifteen states and 2 countries during the five days of broadcasts. 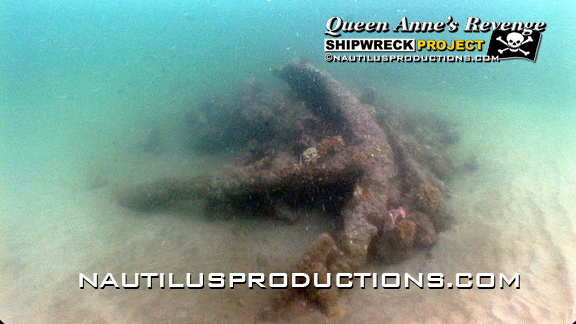 In October 2013 the North Carolina Department of Cultural Resources, Intersal, Inc., and Nautilus Productions LLC signed a Settlement Agreement connected to QAR commercial, replica, and promotional opportunities for the benefit of the Queen Anne’s Revenge Shipwreck Project. On December 1, 2015, Nautilus Productions, which has spent almost two decades documenting the retrieval of Blackbeard’s pirate flagship, the Queen Anne’s Revenge, filed a Federal lawsuit against Gov. Pat McCrory, the State of North Carolina, the Friends of Queen Anne’s Revenge nonprofit, and others, in the U.S. District Court for the Eastern District of North Carolina over Blackbeard’s Law and copyright infringement. A hearing date is pending in the United States Court of Appeals for the Fourth Circuit. Nautilus Productions worked with maritime archaeologist Kimberly Eslinger Faulk, the Ponce Inlet Lighthouse Association (PILHA), the Cambrian Foundation and the Volusia County Reef Team to document their work on the site believed to be the SS Commodore. 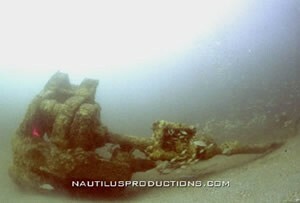 For two weeks in May 2002, Faulk, a crew of technical divers from the Cambrian Foundation, representatives of PILHA and videographer Rick Allen from Nautilus Productions completed the first archaeological survey of the wreck site. In keeping with the Light House’s mission of protecting the wreck site and better interpreting its importance to the people of Ponce Inlet and Daytona Beach, Florida project parameters were laid out for a professional archaeological survey of the site. Nautilus Productions provided video mosaic services, site documentation and recorded survey and diving activities on site. The site believed to be the SS Commodore has been known to the local sport diving and fishing industries in Daytona Beach and Ponce Inlet, Florida for almost four decades. Local diver Don Serbousek (now deceased) seized the site and today it is protected under an Admiralty Claim jointly held by Don Serbousek and PILHA. Monitoring and protection of the site is under the auspices of the Volusia County Reef Team. The SS Commodore sank in a January gale off the northeast Florida coast in 1897. An ocean going steam tug built for the harbor tug work, the SS Commodore finished her career attempting to run guns to Cuba. 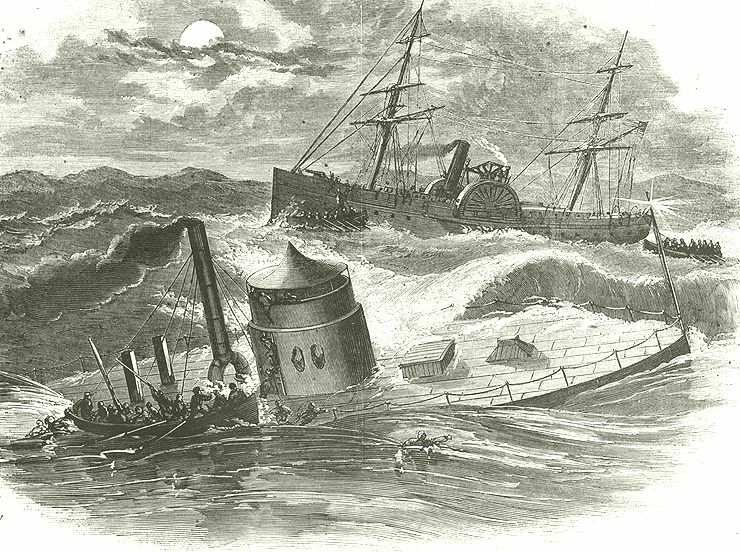 The storm that sank SS Commodore also killed or injured every member of the crew. After three days adrift in a small boat New York Times reporter (and later novelist) Stephen Crane landed on the Florida coast. His tale of survival resulted in the short story, The Open Boat, which immortalized the sinking of an otherwise unknown vessel. The SS Commodore is key to understanding a pivotal time in American History, World History, and Maritime History. Kimberly Faulk, Don Serbousek (now deceased), PILHA, the Cambrian Foundation, the Volusia County Reef Team and Nautilus Productions worked together to identify and preserve this unique maritime treasure. During 2002-2004 three seasons of archaeological investigation were begun in order to archaeologically document the exposed remains and to definitively identify the vessel. The results of this fieldwork were eventually incorporated into a Master’s Thesis produced by Kimberly Faulk, then a graduate student at East Carolina University’s Maritime Studies Program. Later in 2004 scientists from the Lighthouse Archaeological Maritime Program (LAMP) at the St. Augustine Lighthouse & Museum offered their assistance to PILPA in their ongoing investigation of the vessel remains and visited the shipwreck site for a series of dives on April 7, 2004. The recording of the engine remains by LAMP divers resulted in measurements of a 26-inch bore and a 30-inch stroke. These dimensions are a perfect match with the schematics for the single-expansion steam engine built by the Neafie & Levy yard in Philadelphia as listed in the 1882 survey produced when Commodore was first registered. This data, when considered with the accumulated evidence gathered to date, finally substantiated the identification of this sunken vessel as the SS Commodore beyond a reasonable doubt. Initial efforts in 1995 by Navy and NOAA divers to raise the warship’s propeller were foiled by an abnormally stormy season off Cape Hatteras. Realizing that raising the whole wreck was impractical for financial reasons as well as the inability to bring up the wreck intact, NOAA developed a comprehensive plan to recover the most significant part of the ship, namely her engine, propeller, guns, and turret. It estimated that the plan would cost over 20 million dollars to implement over four years. The Department of Defense Legacy Resource Management Program contributed $14.5 million. The Navy divers, mainly from its two Mobile Diving and Salvage Units, would perform the bulk of the work necessary in order to train in deep sea conditions and evaluate new equipment. In 1998 recovery of key elements of the Monitor’s components began. This culminated with the recovery of the turret in August 2002 which was covered by Nautilus Productions while producing stories for the “National Geographic Today” television show. 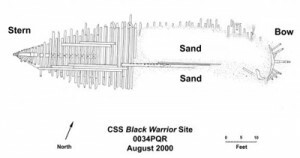 In 2003 NOAA divers and volunteers returned to the Monitor with the goal of obtaining overall video of the site to create a permanent record of the current conditions on the wreck after the turret recovery. Jeff Johnston of the Monitor National Marine Sanctuary (MNMS) also wanted a definitive image of the vessel’s pilothouse. During the dives, the Monitor’s iron pilothouse was located near the bow of the vessel and documented for the first time by videographer Rick Allen, of Nautilus Productions, in its inverted position. Nautilus Productions worked with nautical archaeologists from of the Monitor National Marine Sanctuary, NOAA and the Florida Keys National Marine Sanctuary to document work on the site believed to be the Queen of Nassau (CGS Canada & HMCS Canada). For one week in March 2003 a crew of research divers from the National Undersea Research Center – NURC at UNC-Wilmington and videographer Rick Allen and Kimberly Faulk from Nautilus Productions documented the archaeological survey of the wreck site. 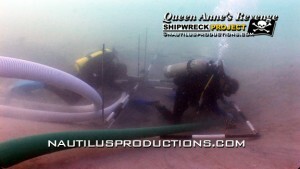 Nautilus Productions provided site documentation and recorded diving activities during the event. Rick Allen of Nautilus Productions videotaping the unique ram bow of the 230′ deep Queen of Nassau. Allen carries in excess of 400 cubic feet of gas to make the 90 minute dive. The steamer CGS Canada was built in 1904 for the Canadian Fisheries Protection Service, and became the first armed, steel-hulled cruiser owned and operated by the Canadian government. The Canada’s ram bow (picture above), 10-to-1 length-to-beam ratio, and steel hull were a departure from the previous style of Canadian armed vessels. Consequently, the Canada marked the transition from traditional wooden schooners to modern steel cruisers, playing a crucial role as Canada formulated its young navy. The Canada was the fastest ship in the Fisheries Protection fleet; it was Canada’s first successful naval training vessel, and the first Canadian naval vessel to train with the Royal Navy was equipped with what was then the smallest Marconi wireless telegraph in the world. After the First World War broke out in August 1914, CGS Canada was officially transferred to the Royal Canadian Navy. She underwent a refit to become a naval patrol ship which saw her forecastle raised and the Maxim guns for fisheries patrol use replaced with two 12-pounder and two 3-pounder naval guns. She was commissioned as HMCS Canada in 1915 and served on the Atlantic coast. In November 1919 and she resumed her former civilian fisheries patrol duties as CGS Canada before being retired from government service in 1920. 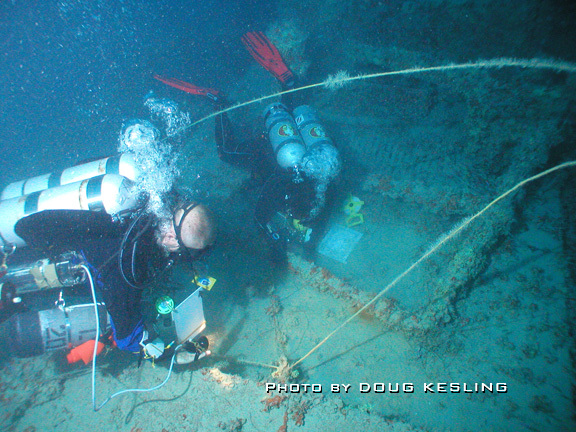 Team members measuring and mapping the mid-ship portion of the wreck. In 1924, the Canada was sold to the Florida Inter-Island Steamship Company. The vessel was renamed Queen of Nassau and used as an inter-island cruise ship for the lucrative Nassau-Miami route. Failing financially in its new role, the vessel sank under mysterious circumstances on July 2, 1926 while under tow. Recreational divers discovered the wreck in 2001 approximately seven miles south of Lower Matecumbe Key and reported their find to officials from the Florida Keys National Marine Sanctuary. The site became the focus of an archaeological investigation by a NOAA team consisting of the Monitor National Marine Sanctuary, East Carolina University, the National Undersea Research Center (NURC) at the University of North Carolina-Wilmington and Nautilus Productions. The vessel is in remarkably good condition, lying intact on top of a white sandy bottom in 230 feet of water. The Black Warrior was originally named the M.C. Etheridge and was built in Plymouth, North Carolina, in 1859. She was a Confederate two-masted schooner, armed with two 32 pounder guns, that participated in the defense of Roanoke Island in North Carolina during the Civil War. She was part of the Southern Mosquito Fleet and her brief wartime career ended with her burning at the Battle of Elizabeth City during an attack by Major General Ambrose E. Burnside‘s Union fleet. She opened fire while still at anchor but when the USS Whitehead turned and closed in for the attack the crew abandoned ship, setting fire to the Black Warrior, and escaped to shore to avoid capture. In 2000 Nautilus Productions joined Doug Jones and the NC Underwater Archaeology Branch during an expedition to map the site. Visibility in the tannic water was only 1 foot at best but we were able to document archaeological activities and an intact gun carriage. The gun carriage was retrieved in 2001 for conservation and later display at the Museum of the Albemarle. In 1998 Nautilus Productions worked with the Surface Interval Diving Company (SIDCo) to relocate, document and identify the remains of Fort Ocracoke. The Confederate fortification constructed at the beginning of the American Civil War was located on Beacon Island in Ocracoke Inlet, two miles to the west-southwest of Ocracoke village, North Carolina. The octagonally shaped fort was built on a previous War of 1812 site. At one point nearly 500 Confederate troops were stationed in and around Ocracoke and the fort. The Confederates abandoned and partially destroyed Fort Ocracoke in August 1861 after Union victories on nearby Hatteras Island. Union forces razed it a month later on September 17, 1861. Beacon Island and the fort subsided beneath the waves of the inlet after a series of hurricanes that struck the area in 1933. 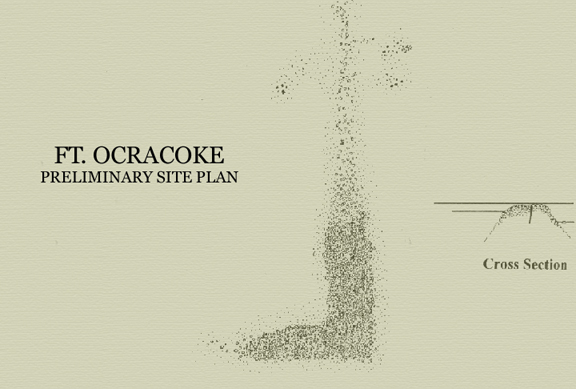 Diagnostic items documented at the site include glassware, pottery sherds and a brick cistern.